Dayne Zorko regrets his actions. BRISBANE captain Dayne Zorko says he is "embarrassed" after cooling off from his firey post-siren spat with Gold Coast nemesis Touk Miller. 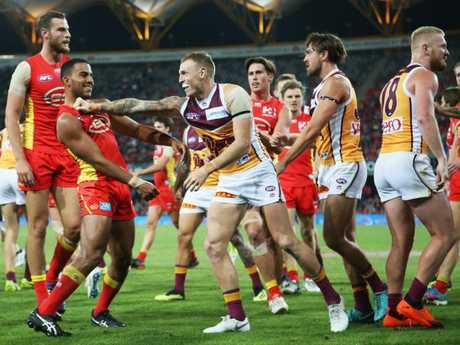 The Lions star admits it wasn't a good look for an AFL captain to trade verbal barbs with his Suns tormentor in the aftermath of Brisbane's tense four-point QClash win. "It's important that I conduct myself well out on the field. Unfortunately, at the end of the game I certainly didn't do that," Zorko said on Tuesday. "(I'm) probably I little bit embarrassed with actually what happened but I'll certainly learn from that. "I certainly expect myself to handle these situations a lot better now being a leader of the football club." 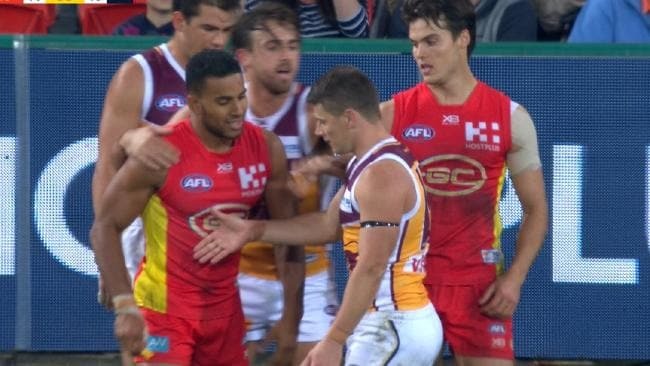 Zorko refused Miller's handshake after the Suns shocked the Lions in round five earlier this season in match in which Miller tagged Zorko and kept him to just 10 touches. But Zorko got in Miller's face and berated him and mockingly shoved his hand out for the gesture after turning the tables on Saturday night. The two sparring partners eventually needed to be physically separated after barely leaving each other's side all night as Miller limited the Brisbane midfielder to a quiet 17 possessions. There was no love lost between the Queensland rivals. Zorko, elevated to the captaincy mid-season after Dayne Beams indefinitely stepped down to grieve his father's death, hinted residual tension played a role in his antics. "Obviously there was a bit of history after the first QClash," he said. "I probably went about it the wrong way but when you play such a competitive sport … in the heat of the battle things tend to happen." The ugly stoush is the latest chapter in a growing rivalry between the oft-forgotten Queensland clubs, a rivalry that has impressed first-year Lion Luke Hodge. "Living in Melbourne I didn't think there was much of a rivalry between Brisbane and Gold Coast, I can tell you there is," the four-time premiership winner with Hawthorn said. "Being out there on the weekend there was a lot said out there, there was some physical acts, it was a good, hard game of football. "For football to grow in Queensland there has got to be more games like that." The 34-year-old veteran, a former captain himself, came to the defence of his rookie skipper as some labelled him a "sook". "A few people have had a crack at Zorks," Hodge said. "But what I've seen of Zorko since he has taken over the captaincy way outweighs the two-second action after a game. "It was big of Zorks to say the emotions got the better of him. I'm tipping next time it'll be game over and move on."